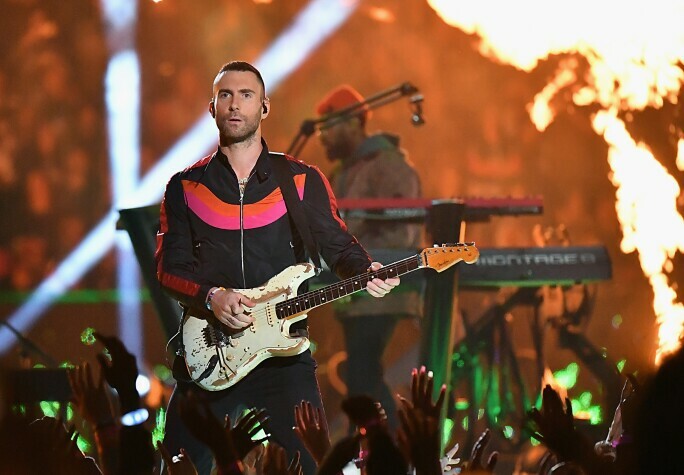 A s Maroon 5's Grammy Award-winning frontman, a coach on The Voice and one of PEOPLE's "Sexiest Man Alive" recipients, Adam Levine is always making headlines. His latest? 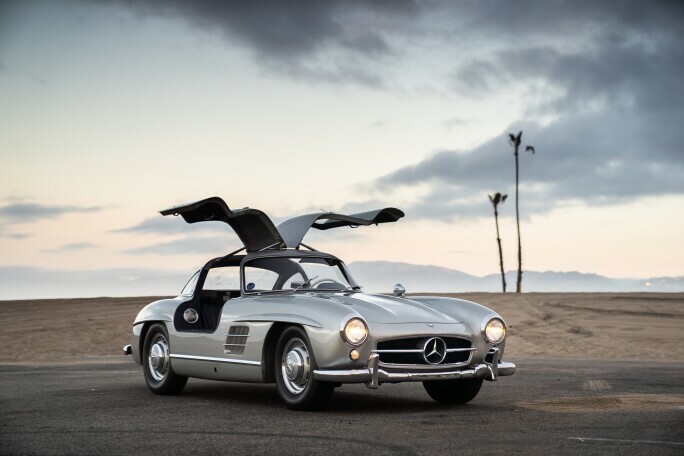 Sotheby's is selling a highly desirable 1955 Mercedes-Benz 300 SL Gullwing, hailing from Levine's collection, at RM's Fort Lauderdale auction (29–30 March). But beyond its star-studded provenance, this automobile is an impressive sports car in its own right. 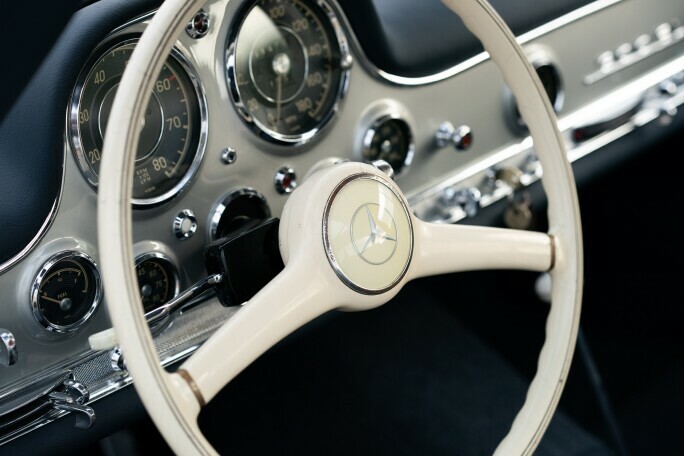 The design of the 300 SL was pure mechanical genius, derived from Mercedes-Benz’s racing experience with the 300 SLR, which claimed an astonishing list of motorsport successes. It was smooth and sleek, with a flowing snout and handsomely rounded tail. Under the hood was a powerful overhead-cam straight-six that was inclined to the side to lower the lines of the front of the car, and below that, there was fully independent suspension. Most important to the design, however, was a welded, tubular-steel, space-frame chassis, which saved weight and strengthened the car. But there was one small problem: the chassis rails passed through where the doors would ordinarily be, making conventionally hinged doors impossible to utilize. Mercedes-Benz’s engineers came up with a unique and seemingly simple solution: to hinge the doors at the roofline and to have them open upward instead of outward. It was an idea, as one historian would later point out, that only worked once, and only because it occurred on the 300 SL was it an idea that was meant to happen. Not just beautiful in design, the 300 SL coupe was capable of an incredible 161 mph thanks to the world’s first fuel-injected engine fitted to a road-going automobile. Quickly earning the nickname “Gullwing” for obvious reasons, the 300 SL remained an industry standard of performance for years and today remains as arguably the most iconic automobile of its era. A special-order example, this 300 SL Gullwing was completed on 11 May 1955, finished in Ivory over Blue leather. The car was shipped to the U.S. on 17 May 1955 to New York City. According to its listing in the Gullwing Registry, the car has lived much of its life in California. In the late 1990s, the car received a high-quality repaint in silver, in addition to reupholstering the interior in black leather. Over the last five years the car has been in the hands of Grammy Award-winning Maroon 5 lead singer Adam Levine. 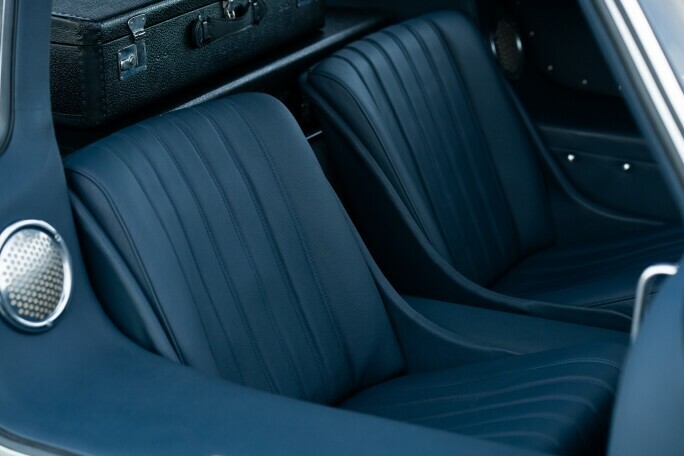 Under his ownership the interior was redone in blue leather, as original. Today, the Gullwing remains a highly desirable numbers-matching example. It is accompanied by fitted luggage, a tool roll, jack, and spare wheel. There has never been a sports car quite like the 300 SL, an understated, overqualified, unparalleled experience for two very lucky people – and an added bonus for a Maroon 5 fan.